In this post in the developerWorks forum, Andy Herlihy is asking about how to create a small calendar that can be embedded into an existing intranet website. As Carl Tyler points out, Andy could simply use Dojo. 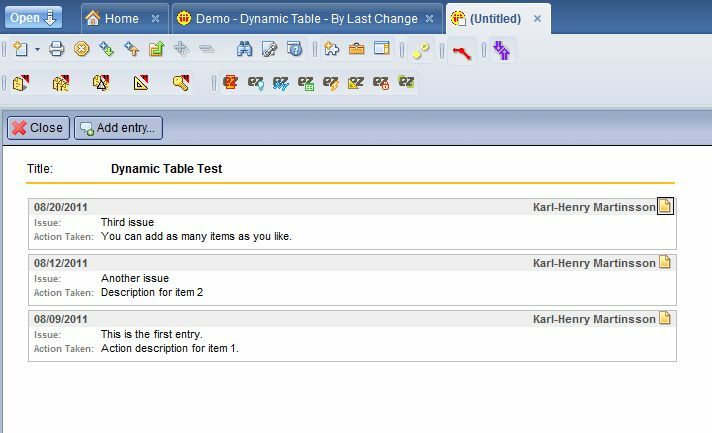 However, this is a good example to show some jQuery combined with the power of IBM Lotus Domino. Lets’ break it down into a few smaller steps. Finally we create the view, it’s associated view template form and a form to create some entries that we can use for testing. cellclass = cellclass + " sundayCell"
cellclass = cellclass + " saturdayCell"
I am setting the id attribute on the cells to the date in yyyy-mm-dd format, and I will also use that in the categorized view that will later use. Using ISO 8601 for dates have several advantages, in our case particular because we don’t have to worry about the / character that will mess up the URL to the Domino view we will call later. I also use class attributes on the cells, so CSS can be used to easily format the calendar. Next we create the web page where we will insert the calendar and also display the entries for any selected day. We load jQuery from Googles CDN, and after the DOM is fully loaded by the browser, we make an ajax call to the Domino server and get the HTML of the calendar back. A form to use for entering calendar data. I called it “Calendar Entry”, and just put two fields on it, ‘CreatedDate’ (computed for display, using @Now) and ‘Title’ (text field). A view called ‘CalendarView’, with two columns. The first one is categorized and is displaying the created date in yyyy-mm-dd format, while the second one is displaying the title field and adding an HTML line break after. The view is set to treat content as HTML. A form called ‘$$ViewTemplate for CalendarView’, set to treat form as HTML. The form only contains an embedded view element, pointing to ‘CalendarView’, and it is set to return data as HTML as well. This is just one example of how you can combine Domino (agents, views and forms) with jQuery in order to integrate Domino based data into your web applications. A question I have seen a few times in the developerWorks forums is how to detect what values (often names) have been added in a multi-value field. This is not very difficult to do in Lotusscript, and there are a few different ways to do it. I prefer to use lists, but you can of course use arrays as well. The basic idea is to declare a global variable to hold the initial value of the field, populate it when the document is either opened or put into edit mode, and then checked when the document is saved. Print nv + " is new." The same technique can be used to detect what fields have changed since the document was opened. Just store the values of all fields (except any starting with $) in a list, then check the values in the fields against that list when saving the document. All very easy when you know how to do it. And again, it shows the power of lists. While reading the developerWorks forums, I have noted that some tasks seem to be common, and users often have issues with it. One very common is to export data from Notes/Domino to Excel. My guess is that some manager/executive want to get the data to manipulate and analyze it in Excel, which they know better, and where reporting can be done easier. But if you just need to export raw data to Excel, there are a couple easy ways to do that. You don’t need to automate Excel, something the programmers posting in the forums seem to frequently do. That just makes things more complicated, and if you run the code in a server agent, Microsoft Office have to be installed on the server itself. Different versions of Excel also cause different issues. Create a HTML table and return it through a browser, with a content type set to open in Excel. Depending on what the requirement is, I usually choose one of those method. The easiest way to get data from Notes to Excel (or any other spreadsheet program) is to simply save the data as comma-separated values (CSV). Use regular Lotusscript file operations and write the values to the file, encased in double quotes and separated by a comma. You need to build a string containing a complete line, as the Print statement adds a line break to the end automatically. The first row is the header, with the field names listed. This helps on the receiving side, but is optional. Dates and numbers don’t need quotes around them, as long as they don’t contain commas. So make a habit to format any numbers without commas. This method is very similar to the CSV method. The difference is that you create a table in HTML, matching the cells in Excel you want to create/populate. But instead of creating a file with the extension .htm or .html, you give it the extension .xls. Excel is intelligent enough to identify it as HTML and map the content correctly. The biggest advantages of using a HTML file instead of CSV is that you get more control over the formatting. By using colspan and rowspan, you can merge cells together, for example in a header. You can also use markup to make cells bold or italic, or even set the text and background colors. This method is a variant of method 2. But instead of calling the agent inside the Notes client and creating a file somewhere in the file system, the agent is called through a URL. This means the Domino HTTP task must be enabled on the server. The URL can be called from inside the Notes client using the @URLOpen function, or the OpenURL method of the NotesUIWorkspace class. It also works with (among other) “application/msexcel” and “application/xls”, but the one above is the official one, so I suggest using that. After you print the content type, simply print the HTML table code to the browser. This will open the HTML in Excel after the agent is done. It’s that easy. I will also mention a few other things I noticed while reading the code posted in the forums. The question is how to identify what dates there are no documents created for. This is where lists are very useful. Richard Schwartz answered this question and posted some good code. Rich suggests to create a list of dates, with each list item having an initial values of false, and then loop through the documents. As each document is processed, the value of the corresponding list item is changed from false to true. You can then go through the list and see which dates still have a value of false, those dates are missing documents. My version of the same code is to actually delete the list item you have a match for, instead if setting it to true. In the end you have a list of just the items of dates without a corresponding document. This could be a blog entry all by itself. But I notice that much of the code in the DeveloperWorkds forums is hard to read”´”. Partially because any tabs or multiple spaces used for indenting the code is stripped out, but also because the posters don´t write easy-to-read code. Which one is easier to understand? In my opinion (and I am sure you agree) the second variant. Also function names and other variables should be named so you understand what they do and what kind of data they contain. Comments are mostly non-existing. It is not that hard to add some comments to the code that explain what the code is doing. But don´t explain every line of actual code (it should be self-explanatory, if variables are named correctly), explain what a particular section of code is intended to do. The comments above will help the next person to look at the code to quickly understand what it is intended to do. Use Option Declare/Option Explicit. This will find many errors, especially for more inexperienced programmers, where variables are misspelled or missing, something that is a very common reason for posts in the forums. This will declare State as String, but all other variables as Variant. This is not unique for Lotusscript, Visual Basic (on which Lotusscript is based) works the same way. 1. Notes UI classes (so they are easy to locate, in case I need to rewrite the code to be used in a server-based agent. 2. Notes backend classes. I always declare them in the order they are being used, as this also is how the classes are structured. 3. Variables and custom classes, in the order they are used. As you can see, I also put a comment there, to explain what lc stands for. See how easy that code is to read? I see many messages where the poster is getting an error message, or an unexpected result (or no result at all). Sometimes a large chunk of code is posted, but no indicator where the error happens. Yes, the debugger has limitations, and it could use some new features (like breaking when a particular variable has a specified value or match an expression), but it is a huge help even in the current form. He was the surprised that the message box displayed the value 4… I think understanding data types is a requirement of being a programmer, even if the language you work with is forgiving or don´t require variables to be declared. Another common issue I see is that it seems like the programmer just got an assignment and started to write code, without thinking through what the actual process is going to be. He/she often write him/herself into a corner, or is so focused on solving it with existing knowledge (e.g. “has to be @Formula language”), that the difficulty level of the task approaches impossible. Or the code will be extremely convoluted. ay be that the user requesting the program/functionality (a.k.a. stakeholder) is saying how he want it to be done, but that is really not the stakeholders responsibility. He/she should just explain what the end result should be, and the developer will design the best solution. I have examples where a manager comes to me and asks for a report “in Excel” of data in a Notes database. That is because the manager in this case was used to working in Excel, and thought of how Excel displays data as the way he wanted it. I could very easily create a report directly in Notes, displaying exactly the same information. Since I asked what the end result was supposed to be, and how the data was supposed to be used (and by whom), I could avoid Excel altogether and built a pure Notes solution. This is where experience comes in, things like that is not something you can just pick up at college/university. If you don´t have the analytical/problem solving skills, you will struggle as a programmer. You might be able to write code under strict guidance, or you might even be able to eventually complete the assignment, but it will most probably not be the best/fastest solution, even if the code will work. Two good blog entries are Separating Programming Sheep from No-Programming Goats (CodingHorror, July 2006) and Why Can´t Programmers.. Program? (CodingHorror, February 2007). Programming consists of problem solving and analytical skills, fundamental skills (like data types, how functions works, recursion different kind of branching/looping), as well as understanding the language and platform you use. If you are missing any of those things, you will probably not be a very good programmer. Today I needed to use regular expressions (a.k.a. regexp) in a Lotus Notes application. I just wanted to check if the user entered a claim number (in the format “nnXXXXXnnnnn”, e.g. 12RICTX12345) in a field. A quick online search found a blog entry with some code using the VBScript object available in Windows, and I adapted it for my application. Just in case someone need this, I am posting the code below. I am not taking credit for the code, I found it on Giles Hinton´s blog and just adapted it a little bit. I also found information about using LS2J and Java to handle regular expression in Notes, which should be platform independent, not restricted to just Windows. Since all our users are on Windows (either directly or through Citrix), I could use the quick method below. But I would probably use the script library posted on OpenNTF for more serious code. Msgbox "Claim number was found in the field." Yesterday my network admin asked me if I could write a simple tool that could provide him with with a spreadsheet of what users had access to a certain database, and through what groups and roles. A couple of hours later I had created an agent that analyze the ACL and identify the users who can access it. The result is presented as a CSV file. I am sharing the code below. It is pretty straight forward. As you can see, I am using lists to hold the data for easy export later to CSV. Run the code with the Lotusscript debugger turned on, and put a breakpoint before the CSV export starts, and you can see how the data is stored in the lists. The function ExpandGroups() is called recursively to drill down, if the group contains additional groups. This function also use a lookup into a custom view, (LookupPeople), that we have in our corporate NAB, I am sure you can modify this code with something that works for you. Enjoy! As always, use the code on your own risk, no warranties, etc. Case 0 : GetAccessLevelText = "No Access"
Case 1 : GetAccessLevelText = "Depositor"
Case 2 : GetAccessLevelText = "Reader"
Case 3 : GetAccessLevelText = "Author"
Case 4 : GetAccessLevelText = "Editor"
Case 5 : GetAccessLevelText = "Designer"
Case 6 : GetAccessLevelText = "Manager"
filename = filename & ".csv"
MsgBox "ACL exported to " & filename,,"Finished"
The other day there was a post on LinkedIn regarding importing Excel data into Notes documents. Someone suggested to save into Access format, and then export from there intosome 1-2-3formatthat Notes can read. I suggested to save the Excel spreadsheet as a CSV file, and then import it. So I decided to write a small generic importer. I built a class called “csvFile”, which I put in a script library called “Class.ImportCSV”. Below is the code for the actual import agent. It creates a new csvFile object, which load all the CSV data into an array in memory. Each array element is in turn a class, containing a list of entries. This is because you can not create arrays of arrays or lists, they have to be in another object/class. If you know the row number and column label (the first row in the CSV file will be considered the column labels), you can address the value like this: csvfile.row(r).entry(“ColumnLabel”).
' *** encouraged to share your modifications.
' *** what so ever. Don't run code you don't know what it does.
' *** Read row and split into cells.
' *** to be split across array items, so we have to fix this.